Culture | What The French?! Feel free to listen to this blast from the past while you consider that France, too, has its fair share of idiotic racism. You may have read in The New York Times that a 15-year-old girl was sent home from school twice recently because the principal thought her skirt wasn’t short enough. That’s right, long skirts are offensive. The scandal of the long skirt is not because the principal is a creeper who must ogle all the legs (although, who knows? ), it’s a religious thing. Or rather, an anti-religious thing. French phrase of the day: signe religieux ostentatoire. In English, “ostentatious sign of religion.” Adjective of the day: laïque (secular). This isn’t some post- 9/11 Islamophobia. Nope, it goes back to 1989 (or to the decolonization, or Medieval crusades, or…). Known as the “affaire du voile” (sometimes “affaire du foulard”), the French allergy to Muslim sartorial choices (or lack thereof) is, believe it or not, is meant as a sign of good will. Baring is caring. The rationale goes like this: France had to put up with a thousand years of Catholicism and monarchy, so when the Revolutionaries tried so famously to undo those things (my personal favorite attempt at secularization was their attempt to reset the calendar create metric-system 10-day weeks. Because, hey, the weekend just comes around too fast, doesn’t it?) they embraced (at least in theory) secularism (la laïcité) as a great emancipator. Think of it as freedom from religion. Not that you couldn’t be religious, but that’s your private business. The separation of Church and State didn’t become law until 1905 (just read the Wikipedia page if you want to know more about it, ’cause I’m about to finish this post), and the debates about the two are ongoing (just like they are in the USA). There is a perverse logic to the French concept of laïcité (seriously, learn that word and throw it around like you write for The New Yorker): if public institutions act like nobody is religious, then nobody can be discriminated against. No, wait, that’s not it. If public institutions ban ostentatious religious displays then we won’t have to endure new iterations of 1980s Madonna “material girl” Jean-Paul Gaultier and ginormous crucifix fashion. No, wait. If we can make Muslim women look less Islamic then the world will have less terrorism. No, that’s not it. I know there are valid points somewhere to be made for 2004 law against headscarves (and other ostentatious religious symbols, whatever that means) Somewhere in there lies a brand of egalitarianism, it’s just really, really hard to find when you read stories like this. Maybe there are some intelligent comments in the Obs French article about it. Peruse away. Reading comments sections of French posts is a win-win: French language practice + a daily dose of pessimism to make you just a tad more French. When I was photographing a bridge on day 1 of a trip to Paris, I noticed this lock with the words “I love you” attached to the bridge. How romantic, I thought. But also, What an eyesore! 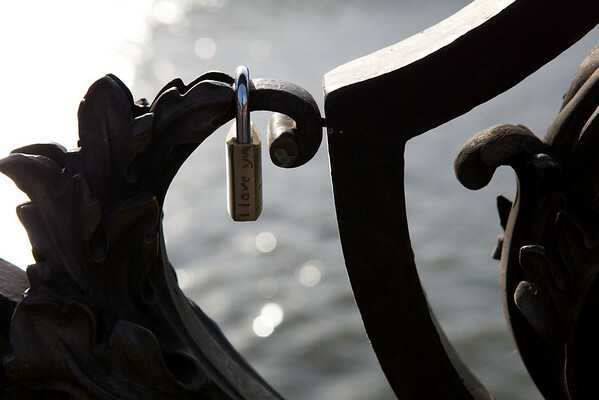 Still, you could imagine the scene: two lovers visit Paris, put the lock on the bridge as a symbol of their undying love, and throw the key in the river Seine to show that the bond will never be broken. 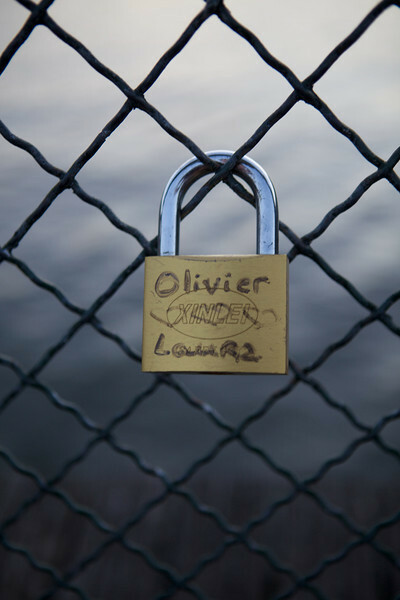 Then, I walked to the pont des arts—the artsy, bohemian bridge where artsy bohemian Parisians and groups of young tourists gather nightly for picnics until 1 or 2 a.m.
Let’s take Olivier, who heart heart hearts Laura. Assuming he didn’t just happen to carry a padlock around with him in case of a sudden bout of eternal love, he must have taken the trouble to go somewhere and buy a padlock and a sharpie. Is this the best he could do? Why choose a lock with a huge XINLEI brand marking right where the hearts go? Or is this a love triangle between a man, a woman, and a padlock company? Get on that, XINLEI marketers. Or is it a serial killer aesthetic? A ransom note? Maybe not the best choice after all. A photo that, in all likelihood, will outlast their summer romance. I overheard a couple of Italian women walking by (this one was near Notre Dame) and wondering if this was some sort of Paris tradition. It’s not! I wanted to call out in Italian. But unfortunately, my spoken Italian doesn’t extend beyond ordering gelato these days. I was in Paris for three months this past fall and there were no locks to be found. So where did it come from? It is unclear who started the fashion. 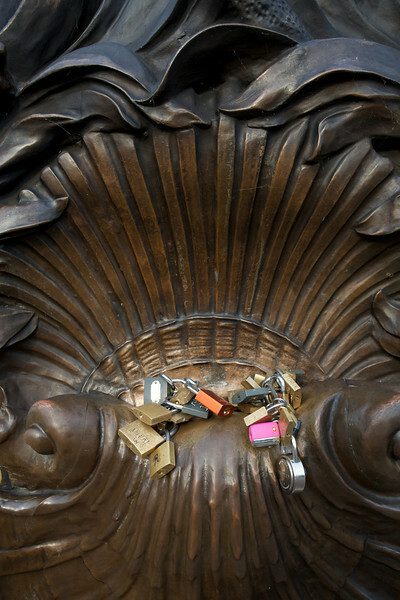 Italians claim it was sparked by a romantic novel called I Want You, by Federico Moccia, in which the hero and heroine attach a padlock with their name onto a lamppost on Ponte Milvio, near Rome, kiss and throw the key in the river Tiber. Who are these Italians claiming it was sparked by a novel I’ve never heard of? Certainly not the women on the bridge. That’s a whole lot of Photoshop work for me and a whole bunch of ugly for Paris. If I could talk to these lock loving readers of Italian fiction, I would tell them to use my own personal rule of graffiti: If it is well done and adds interest to an otherwise drab and dull space, then go for it. But if it defaces something that is already beautiful or has historical significance, then you’re just an irresponsible vandal. 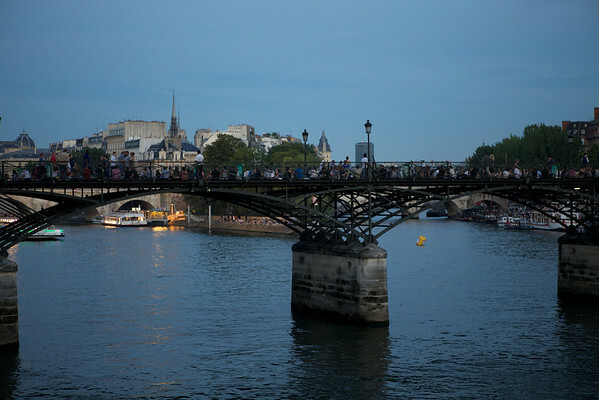 Want to do something romantic on the bridges in Paris? Throw some rose petals in the Seine. It could use a little freshening up. End of incredibly long self-plagiarizing. 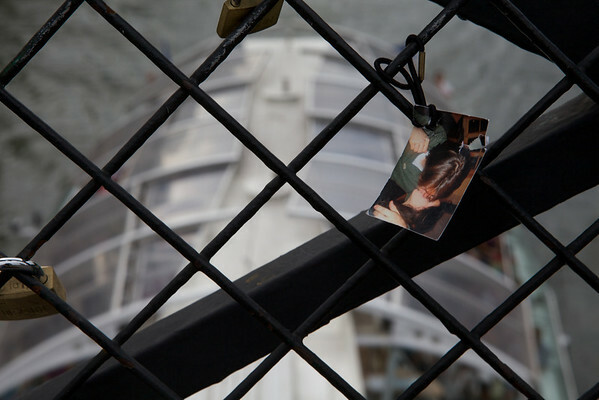 To conclude, let’s look at one last photo: Matt’s lovelock proposal to Sarah. How romantic, right? Maybe on their first anniversary they can return and see it. Or maybe not. It all depends on how fast the bridge fills up. Because every so often, some poor city employee has the Sisyphean task of playing the love grinch, bolt cutters in hand, ready to weed out the signs of last year’s dreams. Now that’s a photo I’d like to take. French usage in anglophone media can range from “pretty respectable” to “was that supposed to be French?” Last week, part 1 took a look at how French was used in Sherlock Holmes(film, 2009). Today’s follow-up takes a look at a more recent example, this time from the TV show Community‘s fifth season (2014). In this clip, a wistful French woman’s voice sings the thoughts of Greendale Community College’s Dean, Craig Pelton, variously described as a “pansexual imp” and “innocent pervert”. His crush on one of the main characters leads him to awkwardly attempt to engineer situations to get him closer to the object of his affections, including, in this scene, a failed attempt to get Jeff to learn Excel with him. So how’s the French? Well…it’s about what we’d expect from an institution with Greendale’s reputation. The most prominent mistake comes at the very end, when the Dean realizes, in song, that his thoughts are in French (with a question mark of surprise). The singing voice audibly says, Mes pensées sont français. See the problem? The word pensée is feminine, so there are two possible corrections to make: either “mes pensées sont en français” or “mes pensées sont françaises”. The latter, though, seems that it would have the meaning of culturally or nationally French…which also doesn’t seem to make sense. The other big mistake comes towards the middle of the song: comme les marins qui fument cigarettes sur le canal”. If Dan Harmon and the script writers had read What The French? !, they’d know that needy nouns like cigarettes need articles: des cigarettes would have worked. The verdict: The style of the singing and the music and the bizarre way it fits the scene are great. The actual French grammar leaves a bit to be desired. No, not her. She’s just a friendly zombie. That one on the left. She’ll come up to you and say “Do you speak English?” And then her friend will pick your pocket. But that’s not who I’m talking about. Yep. There she is. Not the security guard. That creepy woman under the glass. Lisa. Lisa Gherardini (most likely). You know her as Mona. The French call her la Joconde (the jocund one, which is just a lame pun based on her married name Giocondo). If you go to Paris, do yourself a favor and snub this woman. Just skip it. I dare you. You will be stuck behind a 16 year-old man child who bought himself a beret—ya know, to look like genuine Frenchman—which hopefully, upon his return to the US, for his own sake and for the love of taste, he will never wear again. Monet’s gargantuan water lilies span an entire room. It’s even more stunning in person, and you can walk right up close to them and inspect the brush work at your leisure. There are other treasures in the Orangerie as well, but this is the most stunning. And the number of tourists who leave Paris without ever setting foot in Paris is staggering. 10 million a year! Ok. I made that up. I don’t know how many miss it, but if the relative size of the lines is any indication, it’s a lot. Too many. So, I dare you. If you are lucky enough to go to Paris, skip Mona and visit Monet instead. So, if we drink wine and eat cheese, but don’t drink milk we’ll be skinny like French people? Not likely. Well, what then? What are the French hiding from us, and how can we turn it into a pill that we can swallow when drinking our next Double Big Gulp? According to the smug and somewhat condescendingly titled post “10 Eating Rules French Children Know (But Most Americans Don’t)“, French kids eat real food, don’t snack (except for a traditional 4 o’clock after school snack), don’t guzzle soda, sit down for real meals, and appreciate their food. Their school lunch menus read like the daily special at a whole foods café: first course: lentil salad, followed by roasted chicken and haricots verts, then a cheese course, and finally some fresh fruit for dessert. I don’t know why we do this, but we “Anglo-Saxons” love to beat ourselves up with tales of French superiority. What we’re forgetting is that Americans didn’t used to be so fat either. We just radically altered our food system with sugar-laden highly processed foods compounded by stupid nutritional misinformation such as the low-fat craze that helped to inject even more sugar (because, hey!, sugar is fat-free!) into our diets. The “eating rules” of the French were once common sense in America. The French aren’t ahead of us in a secret race to the ultimate diet plan, they are a couple of decades behind us in a race to become the humans of Wall-E.
Sure, the French love to attack McDonald’s (or “Mac-Do” if you want to say it the French way), but not as much as they love eating there. The “McDonaldization” of France is helping teach French kids the secrets that every American child knows: food should not resemble any living plant or animal; it should be deep-fried and accompanied by soda and a toy. And for breakfast? Bowls of sugar!!! Among the most popular cereals in France are sugary gobs of a Nutella-like substance wrapped in a sugary crunchy shell. The French are slowly losing their bragging rights for paradoxical thinness, but they might make up for it in most sugar-laden cereal. An article in Le Monde in 2012 tries to maintain the French sense of superiority by saying that although obesity is a problem in France, the French are “resisting” better than the Brits and the Germans. According to data from the OECD’s website, France is doing better than most, but the projections don’t look pretty. The BBC recently did a story on “The perils of being fat, female, and French,” which suggests that French women might simply have more pressure to be skinny. The “tyranny of the silhouette.” French women have the lowest BMI in Europe, but they are also second highest in anorexia, according to a 2012 study. The recent Sundance documentary, “Fed Up” which claims to “blow the lid off everything we thought we knew about food and weight loss,” while interesting enough, basically boils it down to something that should be painfully obvious: eat too much sugar and you’ll gain weight. Duh. The problem for people buying processed foods is that added sugar seems to be inescapable. Look at the shelves of your local supermarket, read the box labels, and you will see sugar in nearly everything. Part of the secret of paradoxically thin French women is the textbook cliché of going chez le…[insert speciality food shop of your choice]. But who’s got time for that when a massive supermarket with a lot of frozen foods is just down the street? So to conclude, French people do indeed get fat. So start looking for other ways to mystify and envy the French, because unlike that box of choco-treasures cereal, this French paradox thing is going to have a short shelf life. And there you have it—a very What The French?! tour of Christmas Past. The French do have a bad reputation in America when it comes to body odor, but why? Is it because they don’t notice the smell?—Perfume capital of the world? Unlikely. Too much stinky cheese in the diet?—I don’t think Americans are in a position to compare eating habits. I would argue that the French appreciate a wider range of odors than their air freshener-consuming American counterparts. Anyway, in spite of my post title, I’m not here to decide whether Americans smell better or worse than the French (but since we’re talking about it the answer is, it’s a tie: The French know how to use scent better, but they smoke too much and consequently let the cigarette smell destroy their advantage.) Instead, let me say a few words about the art of appreciating perfume. les floraux: floral scents, such as, jasmine, rose, and lily. Test Chanel Nº5 or Joy by Patou. les ambrés: ambery scents usually based in ambergris and vanilla, such as, Jean-Paul Gaultier’s J.P. Gaultier or the men’s fragrance le Mâle by Gaultier. les boisés: woody fragrances, for example, Guerlain’s Mitsouko or Dior’s Dolce Vita. les frais: fresh, often citrus-based fragrances, such as, Un jardin en Méditerranée or Eau d’Orange Verte by Hermès. les fougères: an herbaceous scent more common in men’s fragrances usually based in lavender and moss. Try XS by Paco Rabanne or Hugo by Hugo Boss. les gourmands: scents based in food smells, such as, Thierry Mugler’s Angel and A*Men. The family classification is not an exact science because of the complexity of perfumes. Further complicating matters, a scent changes over time, like a play in three acts. Immediately after applying the scent, you have the notes de tête (literally translated head notes, but it is known as top note in English. Try, for example, Un Jardin sur le Nile by Hermès for an exquisite top note of green mango.). A common mistake among busy shoppers is to consider only the top note of a perfume. Just minutes after application, however, the scent begins to move into the notes de coeur (heart notes, commonly called middle note in English) and stays there for several hours. Finally, the lingering notes de fond (base notes or bottom note in English) remain when all else is gone. In keeping with our theatre metaphor, remember to experience the whole show before forming your opinion. What may start out looking like a comedy in the first act, may become horrible tragedy by act three. If you want to explore something probably not found at most local malls, try l’Artisan Parfumeur or Serge Lutens. Both parfumeurs have interesting lines with unexpected scents. Do you want to smell like the sweat of Mali warriors? Neither do I. But that you gives you an idea of how experimental some of the boutique brands can get. If you want to educate yourself about the art of perfume, the blog Perfume Shrine is a great place to start. I first came across the site when reading an interview with perfumer, Isabelle Doyen. Explore the site, and you’ll find primers on perfume families, “how-to” guides, essays on aesthetics, and more. The short video above will help you appreciate the work of the perfumer. If you want to invest an hour or so, check out the BBC series about perfume. It has three parts. Start here to get hooked and continue to Youtube to view the other episodes. Once you’ve read up on things, you can now go to the mall and quiz the poor person at the perfume counter so they can hate their job even more.